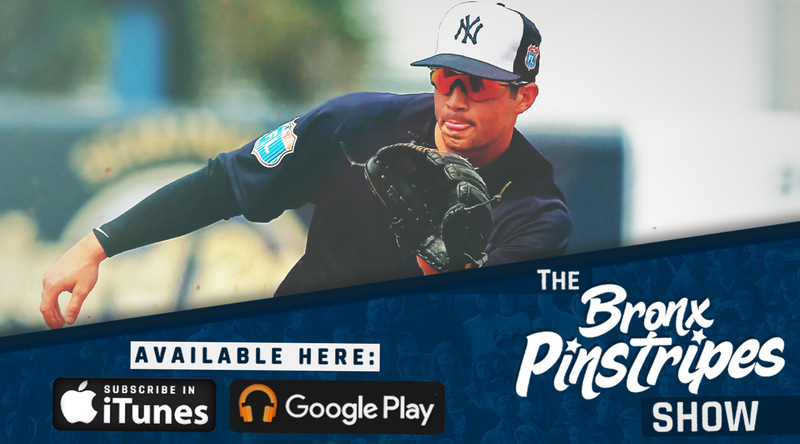 Yankees infielder/outfielder Tyler Wade (@_tylerwade) joined Andrew and Scott this week on The Bronx Pinstripes Show #112. Topics with Tyler include (2:35 – 37:45): his workout routine in the offseason, the competitive nature surrounding Yankees players, his Arizona Fall League experience playing outfield for the first time, being drafted by the team he rooted for growing up, how he became a Yankees fan, friendships he’s made in the Yankees organization, his favorite TV shows, and a look forward to Spring Training 2017. Then we answer mailbag questions about how to judge if a Free Agent was “worth it” and if Yankees fans are over-hyping expectations for Gary Sanchez and Greg Bird. If you plan to attend Yankees Spring Training this year, March 24-26 is the weekend to go. The Yankees have 3 home games and the Bronx Pinstripes team will be in Tampa. We plan on having a fan meet-up that weekend — stay tuned for details! If you are going, let us know by tweeting @BronxPinstripes and @YankeesPodcast. Subscribe to the podcast. If you like the show, please give us a rating and review. Music transitions by BP Show listener, Stevie E.